New Delhi [India], Jan. 18 : The recent verdict on Salman Khan's 1998 blackbuck case, acquitting the actor, may not be gathering a pleasant ground from the Twitterati. Alongside a photoshopped picture of an antelope holding a revolver, one Sir Ravindra Jadeja tweeted, "Of Course The Blackbuck Commited Suicide.The Gun Was It's Own Too.#SalmanKhan." A few minutes later, the user wrote, "#SalmanKhan Gets Acquitted Faster Than I Cook Maggi. BHAI ROX!" "#JodhpurCourt acquits #SalmanKhan after finding black buck guilty of coming in front of bullet," he added, "#SalmanKhan Becomes First Being Human To Perform Best At Courts Without Being A Tennis Or Basketball Player." Find Out! Who does Salman sip `koffee` with? New Delhi [India], Dec.2 : And the wait is over! Salman Khan is all set to appear on Karan Johar's chat show and entertain us with his eccentric nature and infectious laughter. 'Dabangg' Khan recently tweeted a charismatic picture of himself from the sets of ' Koffee With Karan' along with his brothers, Sohail and Arbaaz. "At Koffee with Karan shoot #koffeecentury," he captioned the picture. While ' Sultan' declared in the last season that he is a virgin, we are just wondering what revelation he is going to make this time! Is he going to spill the beans about his relationship with Iulia Vantur? New Delhi [India], Nov.14 : Salman Khan is a doting 'maamu' to Ahil Sharma. Whenever he's not shooting, ' Dabangg' Khan is seen 'spoiling' Arpita and Aayush Sharma's 'monster in making'. Mommy Arpita Khan Sharma recently shared some adorable pictures of her little munchkin, showing how he spent his Sunday with Salman Khan-daan. Looking adorable in a white baby-suit, Ahil is seen chewing 'Sultan's lucky turquoise stone bracelet. Arpita captioned one of the picture as, "Just when I left him I got these pictures.. Mamu @beingsalmankhan & Masi & Mausa @atulreellife spoiling him. Monster in the making!" New Delhi [India], Oct. 12 : Be it his nephew Ahil or his co-star Harshaali Malhotra from 'Bajrangi Bhaijaan,' Salman Khan's fondness for the young ones is not new to the Bollywood audience. Director of upcoming 'Tubelight,' Kabir recently posted on Twitter, several pictures of the 50-year-old star signing autographs for the kids in Manali's Government Senior Secondary School. The caption below the collaged pictures read, "@BeingSalmanKhan signing autographs for school children." Along with the caption, Kabir also hash-tagged words like Tubelight, Manali, BehindTheScenes, Eid2017. Salman had earlier posted a picture of himself posing for the cameras with a bunch of Buddhist monks. He was wearing a full-sleeved shirt, cream pants teamed up with a maroon vest. Colombo, Dec 29 : Indian actor Salman Khan and Sri Lankan-born actress Jacqueline Fernandez are in Sri Lanka to support the election campaign of President Mahinda Rajapaksa. According to the Lanka Page web site, a group of six Bollywood personalities, including the two actors, arrived at the Bandaranaike International Airport on Monday morning. The Big Fat Khan wedding bandwagon rolls into Mumbai for Finale! New Delhi, Nov 19 : After it massive Hyderabad's session the 'Khan-daan' is now gearing up for its Big Fat Mumbai reception! 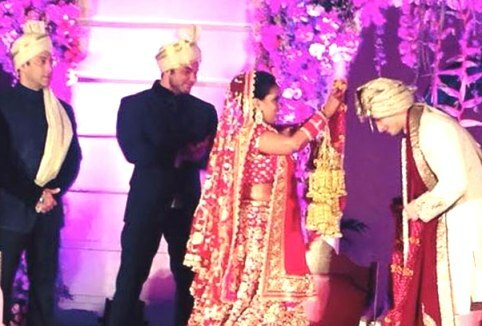 The wedding which is being termed as the biggest wedding of the season is not yet over as the dabangg star Salman Khan is yet to host a wedding reception in Mumbai for all those who couldn't make it to Hyderabad. New Delhi, Nov 5 : The Mumbai court on Wednesday is scheduled for actor Salman Khan's trial in the 14-year-old hit-and-run case. A witness in the case had allegedly told a Mumbai trial court last month that he had seen the actor in the driver's seat of his vehicle in a hotel's parking lot on the night incident took place. 'John Wick' actress Adrianne Palicki finds Salman Khan "charming"
New Delhi, Nov 04 : 'John Wick' actress Adrianne Palicki has joined the long list of bevies to have fallen for Bollywood actor Salman Khan's allure. The actress who is starring in Salman's home production ' Dr. Cabbie' described her experience of working on a movie with such a strong Indian background as captivating. The actress also confessed, she wants to ensure she gets to meet Salman on her trip to India, after missing out on the opportunity to meet him at the Toronto premiere of the movie. New Delhi, Sept 13 : Salman Khan recently unveiled the eighth edition of reality TV show 'Bigg Boss', at an event in Mumbai. Speaking at the event, Khan said, "The show got better with better contestants. "Bigg Boss" does not depend upon me. The show depends on Endemol, Colors and also the contestants that they choose to get into the house. Better the contestants, the funnier the contestants, the more emotional, the angrier the contestants the better the show and the better me." However, the 'Kick' actor said he was reluctant to host the show this year as it was too tiring but later on stated that he chose to be a part of the season eight as he liked the format. New Delhi, Sept 12 : There was a protest against actor Salman Khan outside the Kotla Mosque in the capital today for hurting religious sentiments. Khan's NGO, Being Human, had recently organised a fashion show in Mumbai where a model walked down the ramp wearing a T-shirt on which a word was inscribed in Arabic. This has hurt the religious sentiment of the Muslim community, according to the complainant Mohammad Asim Mohammad Arif, a resident of Mumbai. Mumbai: Filmmaker-producer Karan Johar has slammed reports that he has signed Bollywood superstars Aamir and Salman Khan for Rs 150 crore each. According to reports, Johar had offered Aamir Rs 150 crore for Dharma Productions` next project, while he had given the similar amount to Salman for starring in his ambitious project `Shhuddhi`. "Apparently I have paid 300 crores to 2 major super stars... Yes!! If this is true then I am also looking for a job, a house, and a life! !," Johar tweeted. Mumbai - Actress Kareena Kapoor Khan, who is part of Salman Khan’s next film ‘Bajrangi Bhaijaan’, says she shares a good rapport with the superstar and they make a “lovely pairing” on screen. Salman and Kareena, who were last seen romancing each other on screen in ‘Bodyguard’, will be seen together in the Kabir Khan-directed movie. New Delhi, July 26 : Finally, in the talk show Ek Mulaqat of DD News, Salman Khan did not shy away from accepting that may be he will never marry in his life. The actor reportedly also said that he has no interest in politics; neither does he wish to direct movies but will continue acting. It was in the same talk show in the year 2010, Deepika Padukone considered Salman is the real 'Lafanga' though he has many good qualities that can be inspiration for others. Mumbai: Bollywood superstar Salman Khan feels stardom is ephemeral and he would rather focus his energies on taking his charitable work forward. "Stardom comes every three years and anyone can beat anyone in this. I think till the time fame is there work is there... Till the time work is there money is there and till that time `Being Human` is there," Salman said in an interview here. "I am going to make it so difficult for actors; eventually my mission is to take `Being Human` to a different level and I am struggling very hard for it. I have never worked so hard in life ever," he said. New Delhi, July 7 : The true spirit of Ramadan prompted Shahrukh Khan and Salman Khan, to hug out their differences in Mumbai. Both stars hugged each other at the Iftar party hosted by Congress leader, Baba Siddique who had invited both the national heart throbs. The duo, who had shared cold vibes since 2008, scrapped their differences by embracing each other at the bash. While talking to the media persons on the occasion, Salman credited Siddique for making them meet. "It happened only because of Siddique. Had he not been there, it wouldn't have happened since everybody is busy in their work life," Khan said. Mumbai, June 23 : Bollywood actor Salman Khan on Monday appeared in a local court for the hearing of the 2002 hit-and-run case allegedly involving the actor. Three eyewitnesses has already testified before the court and identified the actor, last month. The 48-year-old actor was seen by these witnesses getting out of his car on that fateful day. One more witness said in the court today that he saw Salman getting out of his car on the night of the accident. New Delhi, June 16 : Salman Khan was spotted unveiling the first look of his forthcoming movie ' Kick' along with the entire star cast of the movie in Mumbai. Speaking at the event, debutant director Sajid Nadiadwala stressed the quality of the movie's script and said, "Our writers have done a fantastic job, and only about 10 percent of the film has been adapted". New Delhi, May 26 : Bollywood superstar Salman Khan and his father and writer Salim Khan, actor Anupam Kher and filmmaker Madhur Bhandarkar were among the high profile Bollywood celebrities who attended the swearing-in ceremony of the country's 14th Prime Minister Narendra Modi and his cabinet at the Rashtrapati Bhavan here Monday. Also actor-politicians Hema Malini, Shatrughan Sinha and Manoj Tiwari, members of Bharatiya Janata Party (BJP), were present on the occasion. Mumbai, May 23 : Several Bollywood personalities are likely to attend the swearing-in ceremony of Prime Minister-designate Narendra Modi and his cabinet at Rashtrapati Bhavan Monday, according to sources. Among the prominent names, who have reportedly been invited, is Lata Mangeshkar who in January this year blessed Modi in Mumbai and wished him all success in his endeavours. Others include superstar Salman Khan, who met Modi in Ahmedabad during the kite flying festival for a film promotion a few months ago. 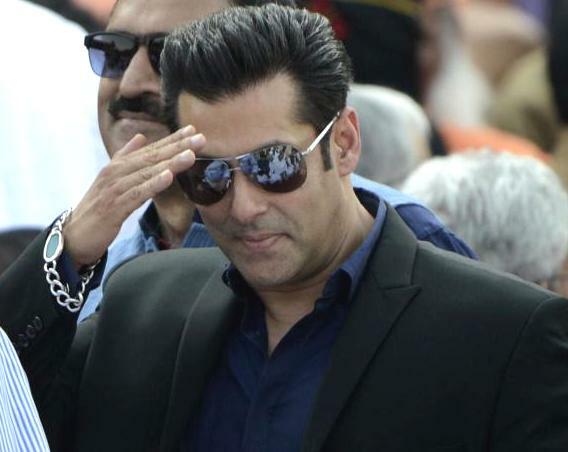 Mumbai, May 19 : A bar waiter Monday identified bollywood actor Salman Khan in court here and said the actor came with his friends to have drinks in a five-star hotel hours before his car allegedly mowed down a group of persons sleeping on the pavement, killing one of them 12 years ago. The waiter, Molay Baug from JW Marriot Hotel, told the court that he had served cocktails and white rum to the group, but could not recall whether Khan also consumed the drinks with his friends that night.